Here’s a first look at Aston Martin’s new McLaren Speedtail rival. Last September, Aston Martin announced that a third mid-engined hypercar is entering production to slot below the extraordinary Valkyrie and Valkyrie AMR Pro being built in collaboration with Red Bull. Now, the British automaker has given us a first look at its new McLaren Speedtail rival. We still don’t know the name of Aston Martin’s new mid-engined hypercar, however, which is currently simply known as "Project 003," although trademark filings suggest the final production car could be called the Valhalla. Details about the Project 003 are still scarce, as Aston Martin hasn’t revealed any new information about the hypercar. So far, we know the Project 003 will be built around a lightweight structure and powered by a turbocharged gasoline-electric hybrid engine. 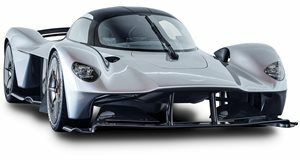 Active aerodynamics will provide "outstanding levels of downforce in a road-legal car,” while active suspension systems will provide "next-level precision.” Compared to the Valkyrie, the Project 003 is designed to be practical for the road and will offer more luggage space, allowing it to potentially compete with the McLaren Speedtail. Production of the Project 003 will be limited to 500 coupe examples worldwide, with customer deliveries starting in late 2021.